Contact between India and Southeast Asia go back 3,000 years. In geographical terms, Southeast Asia is closer to India than China. Many Indian strategic thinkers have embraced the Trump administration’s idea of an Indo-Pacific community. Why is Donald Trump pushing this idea? Quite simply, for a geopolitical reason. Washington DC would like to bring in an equally populous country, India, to balance China’s growing geopolitical influence. The idea of an Indo-Pacific community is a good one. It has deep historical roots. However, if it is seen as an American initiative that is being pushed in an effort to contain China, it will not travel well. Few of China’s neighbours want to alienate it now. However, if the Indo-Pacific idea is pushed by Delhi, rather than Washington DC, it will travel well. History tells us that the Indo-Pacific community existed long before the birth of America in 1776. Just look at the long relationship between India and Southeast Asia. As Jeffery Sng and I document in ‘The ASEAN Miracle’, contact between India and Southeast Asia goes back 3,000 years. In geographical terms, Southeast Asia is closer to China. The largest body of water enclosed by the 10 Southeast Asian countries is called the “South China Sea”. Yet, culturally, the ten Southeast Asian countries are far closer to India. Indeed, nine of the 10 countries have cultural foundations which are Indic, and not Sinic. The Indo-Pacific community should, therefore, be built on these ancient cultural foundations which go back millennia. Curiously, many contemporary Indian thinkers are unaware of the deep Indian cultural roots in Southeast Asia. Even the great Rabindranath Tagore was puzzled. After travelling through Southeast Asia in 1927, he said that he saw India everywhere in Southeast Asia, but did not recognise it. This lack of recognition continues in Delhi. Few Indians are aware that almost 1,400 years ago, the legendary Chinese Buddhist monk Xuanzang wrote, “People of distant places with diverse customs generally designate the land that they admire as India.” This is why India’s historic decision to invite the 10 ASEAN leaders as Chief Guests for Republic Day celebrations on 26 January 2018 is a stroke of genius. It could provide just the right spark to re-ignite a deep and ancient cultural relationship between India and Southeast Asia. To achieve this goal, the Indian government should launch a massive education campaign to make contemporary Indians more aware of this long-standing relationship. This is what our book ‘The ASEAN Miracle’ tries to do. It tells some remarkable stories that will surprise even well-informed Indians. Indonesia is the world’s most populous Islamic country. 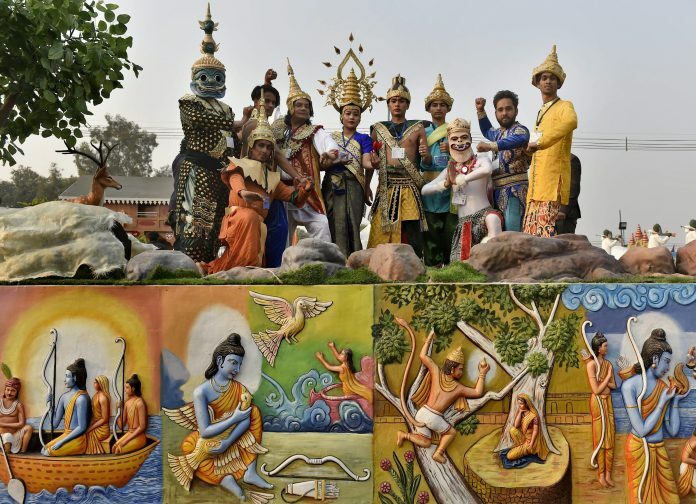 Yet, when its former President Suharto wanted to build a grand monument at one of the capital city’s major roundabouts, he chose to build a massive statute of Arjuna Wijaya in 1987, depicting a scene from the Mahabharata. Tree trunks spiral out of the vaults of the shingled Buddhist temple roofs like the flying buttresses of a Gothic cathedral; branches knot over Sanskrit inscriptions composed in perfect orthography and grammar, before curving around the reliefs of Indic lions and elephants, gods and godlings, sprites and tree spirits. Yet, it is also true that the future cannot be built on the past. If the Indo-Pacific community is to succeed, India’s goal must be to join the major multilateral forum, the Asia Pacific Economic Cooperation (APEC) forum, and change its name from APEC to IPEC. However, the foundations of APEC rest on contemporary trade patterns, not ancient trade links. India must step up to the plate, and engage with East Asia more actively on the trade front. This is why India’s attitude towards the proposed Regional Comprehensive Economic Partnership (RCEP) is critical. The chairman of ASEAN in 2018 is Singapore. Singapore has declared that one of the key goals of its chairmanship is to push for the conclusion of the RCEP. Prime Minister Lee Hsien Loong said in November 2017 at the ASEAN Plus Three Summit that Singapore will do all it can to push negotiations on the RCEP forward as chairman of ASEAN in 2018. Singapore is probably also the most enthusiastic about drawing India closer to ASEAN. Unlike the Trans Pacific Partnership (TPP) which several East Asian countries have signed (despite the withdrawal of the Trump administration from it), the RCEP is a relatively low standard trade agreement. Yet, despite its relative low standards, India is reluctant to sign the RCEP. India is accurate in its assessment that it will have to pay some short-term economic costs if it does so. Yet, if India is to emerge as a significant geo-strategic player in the Indo-Pacific region, it has to balance these short-term economic costs against the long-term geopolitical gains of signing on to the RCEP. Without long-term strategic thinking in New Delhi, the Indo-Pacific community will not take off. There are a few other relatively low-cost steps India can take to rejuvenate the historic connectivity between India and Southeast Asia. One of the major barriers to greater connectivity is the absence of direct flights. Quite shockingly, there are no direct flights between the host of the ASEAN Secretariat, Jakarta, and New Delhi. India can, therefore, present a small gift to the 10 ASEAN leaders attending the Republic Day celebrations. It can declare that one of its key cities will have an “open-skies” policy towards ASEAN airlines. Any ASEAN airline can fly there without restrictions. Commercial considerations will ensure that there won’t be an excessive number of flights. Yet, the gift will be highly symbolic, and will signal that India is ready to take a few critical steps to begin the long march towards rejuvenating the Indo-Pacific community, which started a few thousand years ago. Kishore Mahbubani is Senior Advisor (University & Global Relations) and Professor in the Practice of Public Policy in National University of Singapore. His latest book is The ASEAN Miracle, published by Oxford University Press.